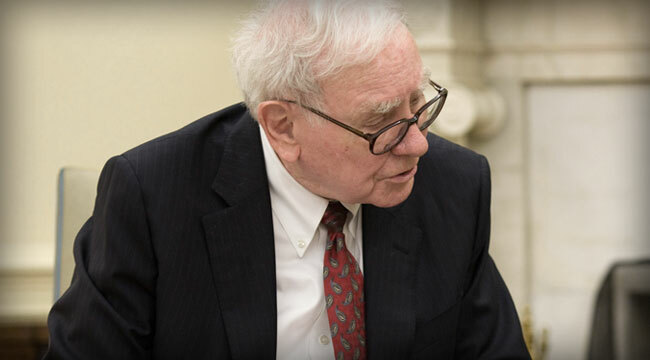 So, Warren Buffett’s letter is out and so is the usual fawning praise from his worshippers. You’re supposed to drop everything and pore over the old man’s words. I’ve read in at least three different places how great an education you get by reading his letters. It’s become a cliché. You may get that education, but you also get a lesson in how to be a world-class hypocrite. Yes, the Mickey Mantle bit is cute. It is in line with Buffett’s golly-gee 1950s-style image he seems to want to cultivate. But Google “Warren Buffett CNBC.” Click on videos. Look at all those appearances by Warren Buffett. Doing what? Well… telling us about his market predictions and giving us his macro opinions. If Warren Buffett thinks macro opinions are a waste of time, maybe he should start by shutting his own mouth. So, as I say, he’s a hypocrite. He says, in essence, don’t listen to anybody’s macro opinions but mine. Warren Buffett is a moneyed goon just like the rest of these pirates. What I really want to say is unprintable. See, that’s typical fare from the old folksy Warren Buffett from Omaha, Nebraska. He ain’t from Wall Street. He’s just a country fella out to sell Coca-Cola and See’s Candies. And he’s got a wallet with a button. Aw, shucks! He forgets that one of his biggest positions is…. Goldman Sachs! Yes, the same firm that Matt Taibbi forever branded “a great vampire squid wrapped around the face of humanity, relentlessly jamming its blood funnel into anything that smells like money.” And with good reason. They are Wall Streeters of the worst sort. Well, maybe Buffett just forgot about Goldman Sachs. But they are not part of the Wall Streeters’ thieving clan, right? Buffett’s single largest position is Wells Fargo & Co.
You mean the Wells Fargo who, along with Bank of America, made the Dirt Diggers Digest’s list of major financial institutions whose track records amount “to one of the most brazen crime waves in the entire history of capitalism”? You mean the same bank “whose fraudulent and predatory practices helped instigate the financial collapse. It is the same bank that continues to foreclose on homes across the country, despite having received a massive government bailout.” (This from a website dedicated to tracking its crimes). People such as Warren Buffett get an undeserved free pass in American life. We chuckle and smile at his folksy humor. But underneath he is just a Wall Street marauder with nicer manners. Boy, are we suckers. He likes to criticize Wall Street. But he’s part of it. He is a thief himself, a recipient and beneficiary of government bailouts. It just goes to show you that if you make a lot of money, you can get away with almost anything in this country. Buffett either can’t see it, or he knows full well what he’s doing and just doesn’t care about what you peons think. After all, when Jamie Dimon – the head of JP Morgan – got a 74% pay raise for his 2013 performance to $20 million, Buffett defended him. “If I owned J.P. Morgan Chase, he would be running it and he would be making more money than the directors are paying him,” Buffett said. Oh, that reminds me. Buffett owns shares of JP Morgan, too! There isn’t a crook around that Buffett doesn’t like. Let me sum up by saying that Warren Buffett is indeed a great investor. He may well be the greatest investor who ever lived. People will study his career for as long as there are stock markets. And they should. There is a lot to learn. In earlier days, he was truly a superb investor. In the last decade, though, he’s become more of an oligarch using his money and influence to make deals and reap gains no other investor ever has a shot at duplicating. He likes to criticize Wall Street but his criticism rings hollow. He is a Wall Streeter extraordinaire. And he’s invested with the worst of them up to his glasses! Ed. Note: If, after reading this essay, you feel a bit swindled by the old “Oracle of Omaha,” don’t let it get to you. He’s had a lot of practice. Still, this is important to know. And in today’s Daily Reckoning, readers were treated to even more of the story. Sign up for FREE, right here, to make sure you get the full story, every day.